Capacity to build access to CityLink to the north and south at the start of the project to allow the tunnel spoil to be transported directly from the portal and thereby minimise truck traffic in nearby streets. Potential for the viaducts to be integrated into the urban fabric of the re-developed Arden Macaulay precinct, as has been highlighted by architects Atelier Red + Black. 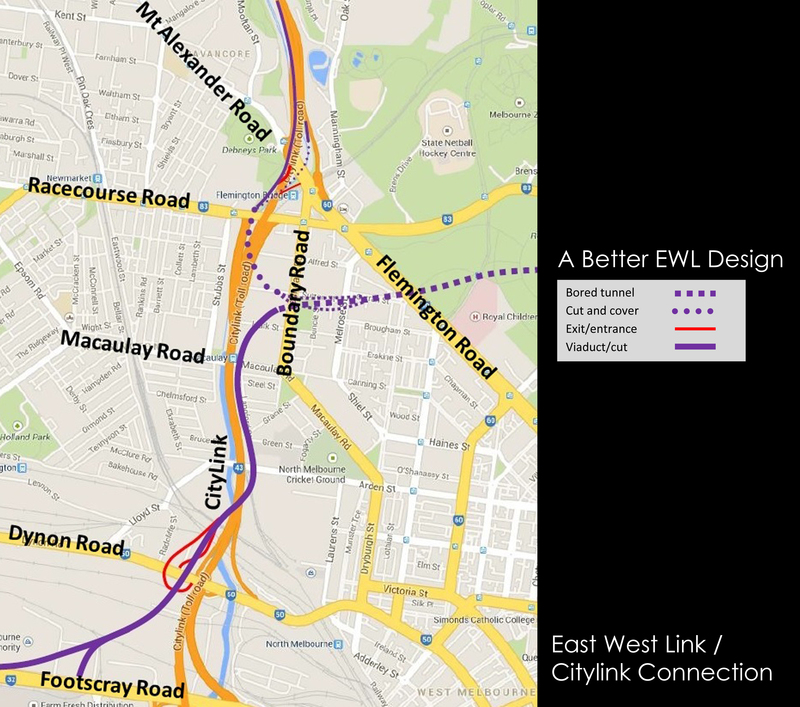 As shown in the map above, the SNRP Option 1 includes a tunnel that extends beneath Royal Park and Flemington Rd to emerge on the western side of Boundary Rd in North Melbourne. Cut and cover tunnelling techniques would extend the bored tunnel from Boundary Rd to a viaduct that would head southward on the eastern side of City Link. This viaduct could be built to Footscray Rd as part of Stage 1 and potentially include an exit at Dynon Road, if this was deemed to be necessary for connection to the hospital precinct. The viaduct from the tunnel to Macaulay Rd could be integrated into the Arden Macaulay precinct in a number of ways. Atelier Red + Black has presented a comprehensive way that it could be developed. One should also consider how Kings Way passes through the Crown Entertainment complex to see what is possible with the integration of a viaduct. South of Macaulay Rd, the land under the proposed alignment is already owned by the Victorian Government (VicTrack) and so this use current could continue albeit with a roof overhead. Alternatively, the area beneath the viaduct in this area could be used for carparking for the adjacent developments, allowing more space to be available on the freehold land. Cut and cover techniques would also be used to extend the tunnel beneath CityLink, the Upfield rail line and Racecourse Rd to provide connections to the northern section of City Link. This would be achieved with a viaduct that would extend alongside to Debney Park, over Mount Alexander Rd and over the current on-ramp to the Tullamarine Freeway. To access the tunnel from the north, a tunnel would be constructed from the Flemington Rd off-ramp, which would extend under Mount Alexander to connect to the tunnel. If deemed to be necessary, a tunnel exit and entrance could be included at Mount Alexander Rd, which would allow ready access to/from Flemington Rd, Mount Alexander Rd, Boundary Rd, Elliott Ave and Racecourse Rd. Provides a design that may be a lower cost than the Reference Design.